Clique na figura abaixo para fazer a sua inscrição. 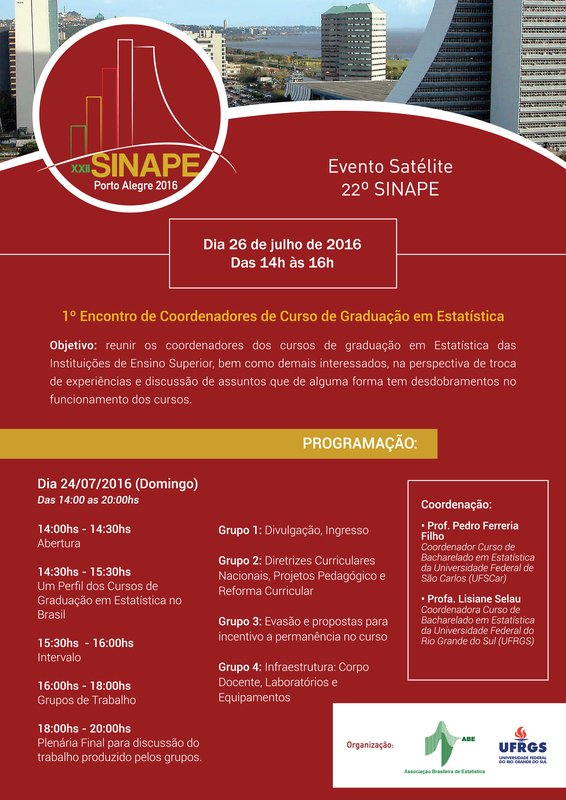 O 1ª Latin American Conference on Statistical Computing (LACSC) é um evento satélite do 22ª SINAPE e será realizado entre os dias 22 e 24 de julho de 2016. O tema da Conferência é “Statistical Computing for Data Science” e o evento ocorrerá no Centro de Eventos FAURGS, na cidade de Gramado (RS). O programa científico contemplará palestrantes da América Latina, sessões temáticas, comunicações orais e posteres. Abstract: The Official Statistics Institutes has been facing complex challenges recently. It’s also happening at the Economy and Statistics Foundation of Rio Grande do Sul (Brazil) with the employment and unemployment survey. Budget constraints, changes in household structures and population habits, turnover of interviewers and other research staffs and public safety are some of the reasons creating the difficulties related to precision and accuracy as well as following the Fundamental Principles of Official Statistics. Added to this, the Official Statistics Institutes has been demanded for more timely and specific information. In order to confront these issues, some perspectives and possibilities has been proposed and discussed in several articles and implemented by some Institutes around the world. In this context, this article aims to identify these possibilities and strategies which has been used, from the traditional – marketing official statistics and administrative sources – to the ones that came together with the digital era – big data, web surveys, web panels and others. After a literature review about all these aspects, some practical efforts are presented and discussed in order to serve as guiding points for future research and decisions. Abstract: This presentation points out the challenges faced by ObservaPOA on generating reliable statistic data for Porto Alegre, such as the lack of updated legislation on the city territorialisation - and how it brings about both the generation of primary data and the use of secundary data. Beyond challenges, the solutions found by our team will also be presented. Marcelo Pitta - Centro Regional de Estudos para o Desenvolvimento da Sociedade da Informação - Cetic.br. Abstract: The transversal nature of communication and information technology (ICT) affects society in different ways and forms. The measurement of access and use of such technologies is fundamental to elaborate and monitor government policies. These technologies are used by enterprises, government, schools, health facilities and the population in general. In this context, Cetic.br conducts nationwide surveys on infrastructure, access to and use of ICT in Brazil, publishing data regularly for policymakers, academics and civil society. This presentation aims to show, in short, the methods used in those surveys and describes new studies that are being conducted in order to use Big Data to produce ICT statistics. Abstract: Official Statistics are indispensable for a democratic society and an asset to promote informed decision making. In 2014, the UN General Assembly adopted a resolution endorsing the Fundamental Principles of Official Statistics (FPOS) that have been applied worldwide since their approval by the UN Statistical Commission in 1994. The FPOS cover important aspects of the production, dissemination and use of Official Statistics such as relevance, impartiality, accountability, transparency, professional standards, scientific principles and sources of data. National Statistical Offices in charge of producing and disseminating Official Statistics continuously meet the challenge of producing fit for purpose, timely and relevant statistics based on appropriate methods while facing increasing budget constraints. This presentation introduces the challenges to incorporate the potential advances and advantages of Big Data for producing Official Statistics. It will present an overview of the current international discussion comparing the traditional sources for Official Statistics based on frameworks for statistical inference considering census and survey (designed) data with those arising from organic sources of (big) data, raising the issues related to selectivity bias, reproducibility, data governance and the FOPS. The production of public information and statistics has grown and diversified to meet the continuing demand to know the economic, social and environmental realities of countries, regions and population groups. At the same time, the producer organizations budgets of such information and statistics have suffered increasing pressure. One consequence of these two trends has been the relentless pursuit of increased productivity in their production processes, analysis and dissemination of information. Another consequence has been the attempt to expand the uses to which can be made of the information already collected and available to meet the demands that arise Given the centrality and relevance of public statistics for the development of Brazilian society, the session provides a space for discussion and presentation of innovative challenges and initiatives in the production and dissemination of public statistics in Brazil. Abstract: The world of analytics, machine learning and big data are increasingly in evidence. The presentation will summarize the SAS vision in addition to showing real cases in companies.